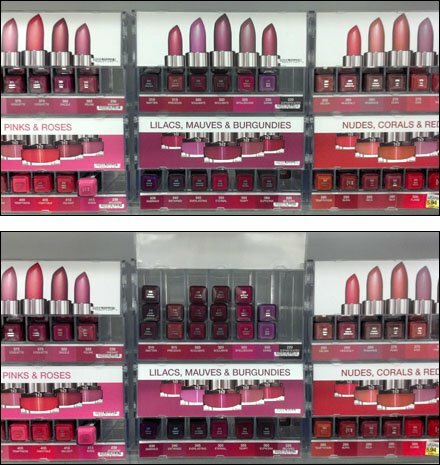 Typically FixturesCloseUp shuns cosmetics because of all the custom design. There are few, simple solutions with widespread applicability. But I very much appreciated this simple yet good-looking and elegant, gravity powered Top-load Lipstick Auto Feed solution. 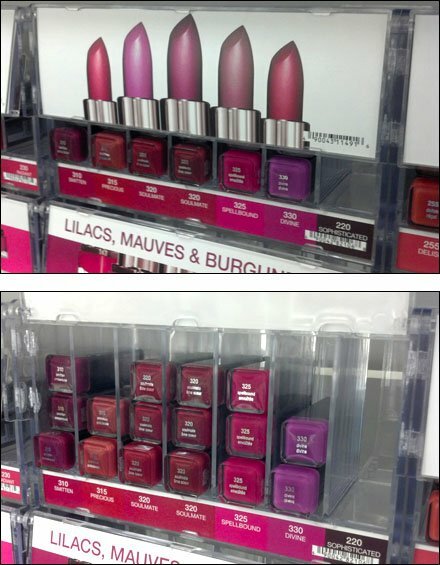 The display point-of-purchase signage just swings up and allows quick refill of lipstick tubes with glass bottoms to show the actual color. The oversize graphics immediately communicated rough color range to help one narrow the choices quickly. CLICK the thumbnail for an alternate Closed / Open view duality.